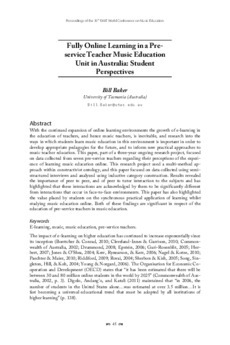 With the continued expansion of online learning environments the growth of e-learning in the education of teachers, and hence music teachers, is inevitable, and research into the ways in which students learn music education in this environment is important in order to develop appropriate pedagogies for the future, and to inform new practical approaches to music teacher education. This paper, part of a three-year ongoing research project, focused on data collected from seven pre-service teachers regarding their perceptions of the experience of learning music education online. This research project used a multi-method approach within constructivist ontology, and this paper focused on data collected using semistructured interviews and analyzed using inductive category construction. Results revealed the importance of peer to peer, and of peer to tutor interaction to the subjects and has highlighted that these interactions are acknowledged by them to be significantly different from interactions that occur in face-to-face environments. This paper has also highlighted the value placed by students on the synchronous practical application of learning whilst studying music education online. Both of these findings are significant in respect of the education of pre-service teachers in music education.